Use year-round to easily apply granular seed, fertilizer, and lawn chemical materials. In winter, use your spreader to apply sand, salt and other melting agents. The spreader features a durable steel frame and a fully-enclosed gear box. The Brinly 42-inch Lawn Sweeper is a tow-behind tractor attachment that collects leaves and grass clippings into its high-capacity 20 cu. ft. hamper. The 5:1 gear ratio results in higher tip velocity, generating more force to lift leaves and debris up off the ground and into the hamper. Consistent brush to ground contact prevents the unit from "skipping" and passing over sections of leaves and grass clippings on the lawn. By incorporating 6 brush sections, brush to ground contact is significantly improved over traditional 4 brush designs. This is accomplished by reducing "Tip Lift" the time and distance that the brushes lift off the surface of the lawn between strokes. When not in use, the patented self-storing feature allows the unit to be stored upright to minimize the required storage space. Stop raking and put your mower to work with the Brinly 42-inch Lawn Sweeper. The Pro-Lift T-5500 Lawn Mower Lift will help keep you ahead of the game with your routine lawn mower maintenance like belt replacement, blade sharpening, and debris removal in a safe and timely manner. The 6 ton hydraulic bottle jack ensures a front axle saddle lift capacity of 750 lbs. and wheel bracket lift capacity of 500. The wheel stirrups are adjustable from an inside bracket width of 20 in. to an outside width of 59 in. accommodating most garden tractor and Zero-Turn mowers in the market. The design of the T-5500 is raised by the operation of an effortless and convenient foot pump to 27 in. high, providing plenty of room to safely and freely access the mower undercarriage. While under the load, the added safety features are working for you with the professional premium grade 6 ton bottle jack and the automatic mechanical locking mechanisms that makes the T-5500 double as a safe maintenance stand as well. 44-inch 10.5 HP Tow Behind Grass Mower is rated 3.8 out of 5 by 4. Rated 5 out of 5 by HomeDepotCustomer from Mower just what I thought it would be, starts right... Mower just what I thought it would be, starts right up and cuts high grass. Shipping was a little bad because of a full size tractor trailer rig but the driver was a pro. So far it works great. Rated 1 out of 5 by Engineer from Not as Advertised This mower was a huge disappointment. The assembly and operation manuals are woefully inadequate. I am a mechanical engineer, and. I had to make several phone calls to Swisher to find out info that should have been in the manuals. I do have to acknowledge that Swisher Tech Support was helpful. Changing this mower from trailing directly behind to offset either left or right, or changing offset from left to right, etc, requires 2 wrenches and is a huge time consuming hassle. 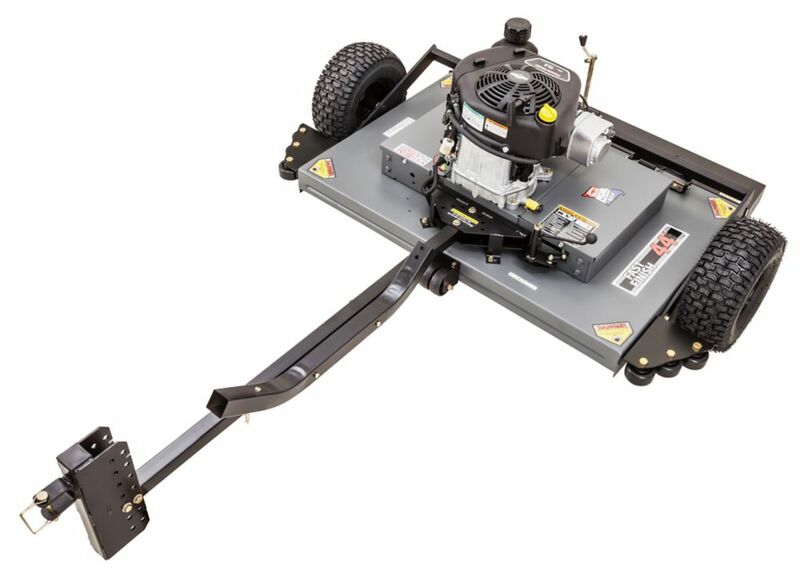 Swisher claims this mower is "The ultimate time saver" - that it is "Designed to dramatically reduce your mowing time...easy left-to-right adjustable offset hitch...no tools required". Those claims are blatantly false. Also, it requires considerable arm strength to pull the rope to start the engine. After a couple of weeks of frustration, I finally returned this mower.